Many Christians in the Middle East harbor “anti-Zionist” resentments, but those resentments are rooted political injustices and not theology, according to a top Church official in the Holy Land. 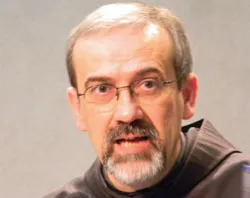 Franciscan Father Pierbattista Pizzaballa said the tensions were reflected in the recent Synod for Bishops on the Middle East, but he rejected charges that the synod was biased against Israel. "I don't think the Synod Fathers were taken hostage by anyone," he told the Italian newspaper Il Foglio Oct. 27. Father Pizzaballa is the Vatican-appointed custodian of the ancient Christian holy sites in Israel and Palestine. In an interview with the paper’s Vatican analyst Paolo Rodari, he responded to charges made by Israel’s deputy foreign minister, Danny Ayalon. Ayalon charged that the synod had become an "important forum for political attacks" and was "taken hostage by an anti-Israeli majority." "That the Arab world might have little sympathy for Israel is evident," Father Pizzaballa said, noting that 90 percent of Christians in the Middle East are of Arab origins. He called it a "normal thing" that this sentiment might surface "in some way" during the synod’s discussions. But the synod's final message also included condemnations of anti-Semitism and anti-Judaism and a reminder that Christians must study both the New and the Old Testaments, he said. It is "not a given," that the synod fathers of the Middle Eastern world would write these words, he said. Father Pizzaballa also pointed out that the synod’s final message condemned all forms of racism and “Islamaphobia,” and called Jews, Muslims and Christians to greater commitment to dialogue. While individual bishops might express their opinions on these issues, only the final message of the synod reflects the official position of the assembled Church leaders, he stressed. It is rather "simply the voice of the synod fathers." The synod’s final message offered little new with respect to Israel, he added. The gathering of bishops condemned Israel’s continued occupation of Palestine and any use of God's name to justify violence. These are positions "already expressed in the past” by Church leaders, he noted. Accusations that the synod fathers harbor an “anti-Zionist” bias are misguided. Zionism, the belief that Israel has the right to a homeland in the territory promised to the Jews in the Bible, is a “Western category,” Father Pizzaballa said. “It is a way with which the West tries to describe a situation." "That a certain anti-Zionism might be present also among Christians in the Middle East is evident,” he said. “But this anti-Zionism, if it exists, it does not have theological foundations. It is more than anything a sentiment motivated by the Israeli-Palistinian conflict. It is a reaction to a dramatic situation and in which immediate solutions are not seen"
The issue of anti-Zionism surfaced after remarks by Melkite Archbishop Cyrille Salim Bustros of Newton, Mass. in the concluding press conference of the synod, Oct. 23. Father Pizzaballa said the controversy reinforces the need for greater dialogue between Jews and Catholics and deeper study of the ways Scripture is interpreted in each tradition. Christians, he said, “are accustomed to making a spiritual and allegorical reading of the Scriptures and our reading does not always fit together with that of the Jews."